Please refer to the Health and Safety Executive website for the definitive guide to the Control of Asbestos Regulations 2006, which legislate the requirements for dealing with asbestos. 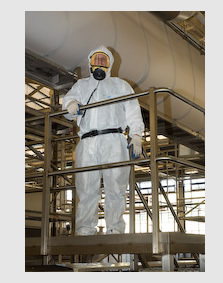 Exposure to the asbestos fibres is sporadic and of low intensity where the concentration of asbestos in the air will not go above 0.6 fibres per cm3 measured over 10 minutes. It is clear from the risk assessment that the exposure to asbestos will not exceed the control limit. Encapsulation or sealing of asbestos-containing materials which are in good condition. Removal of materials in which the asbestos fibres are firmly linked in a matrix, for example asbestos cement; textured decorative coatings and paints which contain asbestos; articles of bitumen, plastic, resin or rubber which contain asbestos where their thermal or acoustic properties are incidental to their main purpose (e.g. vinyl floor tiles, electric cables, roofing felt) and other insulation products which may be used at high temperatures but have no insulation purposes, for example gaskets, washers, ropes and seals. Collecting bulk samples to identify asbestos. In situations where a licence is not required compliance with the general rules outlined by the Control of Asbestos Regulations 2006 must be observed in order to prevent exposure to asbestos. The work must be carried out safely and there must be compliance with legal duties.